The skirt of the mask should wrap around your eye area without any gaps. Find the mask that fits you best, and then pick your color from there. Having the right mask can make your diving experience one of pure joy or of frustration. No one wants that experience. First and foremost is fit. It doesn’t matter what features or what price. If it doesn’t fit, it doesn’t fit. To find the proper fit one must try quite a few out. With Force-E’s huge selection in our South Florida locations, one can certainly find the right mask. Here is how to do it. First move the mask strap out of the way. Next place the mask up against your face and inhale through your nose slightly. A well fitting mask will grip your face while holding a slight inhale. If you have to make an extra effort by continually inhaling, the mask does not fit. Move on to try the next one. If possible, look in a mirror. Our shops have mirrors right by the masks. Better yet, have one of our instructors help you out. Look at the fit to make sure your forehead or cheeks don’t press up against the glass. There should be no pressure points or any discomfort on your face. If there is, then try another mask. Once you have found the proper mask you will need to prepare the mask for use. Why “prep” the mask? During the manufacturing process there is a residue left behind that gets on the glass lenses that allows the mask to pop free of the mold. This residue prevents water droplets from forming a film that allows you to see through it. The mask will be foggy. It doesn’t matter what brand, all new masks will fog from this residue and require somewhat of a break in period. Force-E has the best available product for this task. Gear Aid’s Seabuff works wonders! With about two treatments it should be good to go. These treatments are to be done one right after the other. Other methods require more applications and more elbow grease. 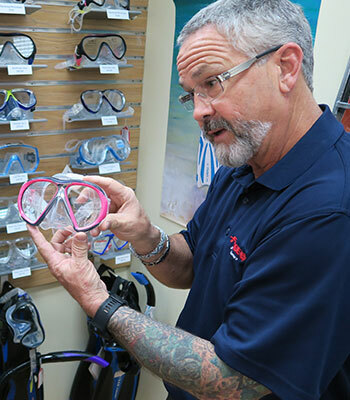 Pre-dive your new mask (or any mask) requires a little more prep. Check the mask skirt and lens seal for defects and the strap for cracks. Your SCUBA instructor should have showed how to defog a mask. Just a drop of defog in each of the lenses followed by a rinse of the excess with fresh water. I wear contact lenses and have very sensitive eyes. Some charter boats use a cheap alternative, watered down baby shampoo. This may have drawbacks. Baby shampoo has a scent that can irritate your eyes for the duration of the dive. It isn’t actually “tear free,” it burns my eyes in the first minute. The viscosity of this mixture is not thick enough, meaning it wears off after about 25-30 minutes. Another great product designed specifically for this purpose is Gear Aid’s Seadrops. Store it in the box with the mask and you always have it ready when you dive. It is the number one recommended defog product available. Try it for yourself and see! You bought the mask that fits best. You prepped it well for your dive. Here is how to care for your mask post dive. Rinse or soak your mask in fresh water for at least 30 seconds. I highly recommend drying the lenses with a paper towel to prevent hard water stains. Also allow the mask skirt and strap to fully dry, doing so before putting it back in the box prevents mold. I would recommend buying two of your favorite masks -- just in case the manufacturer discontinues your favorite, best fitting mask.